The main cluster of tombstones remaining at Khojivank, 2011. The Armenian Pantheon of Tbilisi also known as Khojivank (Georgia. Many notable Armenian writers, artists and public figures are buried there. It formerly consisted of huge memorial cemetery and St. Astvatsatsin church (Holy Mother of God). The church and most part of the cemetery was destroyed in 1937, and most of the remaining part of the cemetery was destroyed between 1995 and 2004 during the construction of the Sameba Cathedral. A tiny part that remains, together with some relocated gravestones, is preserved as the Armenian Pantheon of Tbilisi. The area was given to Armenian year of 1104 with the wish of God I, Khoja Bebut and my brother Khatin and my wife Lali built this church of humble Aslan". St. Astvatsatsin church was dedicated to Saint Purple Mother of God, was circled in fence, had beautiful walls and had a blossoming garden beside. Later the diploma of Bebutovs was renewed by Teimuraz II and Erekle II. In 1899 a massive boundary wall was built around the cemetery, which by that time had enlarged immensely to become the largest Armenian cemetery in Tbilisi. The number of graves in the period before its destruction reached more than 90,000. By the 1920s burials in Khojivank had almost ceased. In 1934, on People's Commissariat for State Security were seeking for precious items around the cemetery. This continued until 1938, by which time most of the cemetery had been destroyed, with only little part of the graves were saved and generally moved to Petropavlovskoe cemetery. The gravestones of Hovhannes Tumanyan and Raffi were saved. The area was rebuilt as a park with the preliminary name "26 Commissars Park of Culture and Leisure", but its final name was "Friendship Park", where the walls were built mainly of Armenian gravestones. On 17 March 1962 the Armenian Pantheon was opened containing about 30 saved gravestones - most of which did not have any human remains beneath them. In 1994 construction of Holy Trinity Cathedral started inside the park area. At first it was announced to occupy area beside Khojivank, but the size of the new church was huge and it covered significant part of Khojivank, including the site of the St. Astvatsatsin Armenian Church. During foundation work for the church, bulldozers and excavators dug up the remains of thousands of those who had been interred in the cemetery, and around the future church mounds of skulls and bones were formed. These human remains, mixed up with broken tombstones and other debris, were later taken away in trucks to an unknown destination.. Most of the remained graves were removed, most gravestones removed. Grigoriy Dolukhanov's gravestone was thrown in front of Armenian theater and left for several years. As a response to Armenian protests the construction temporarily stopped. In June 1997 construction started again. In 25 December 2002 first church service was held. On 23 November 2004 Sameba church was officially opened. The graves in the cemetery had a great number of epigrams and gravestones with short notes, which revealed much about the Armenian population of Tbilisi, families, various heritages and different sides of social life. Among the more famous epigrams were Sayat-Nova's wife's gravestone epigram, which said "456 (1768 y.). In this grave I am - wife of Sayat-Nova Marmar. Bless". Another example was epigram: "Here I am - wife of Ter-David, Archpriest of Mughni church. Who reads remember. Summer 420 (1732y.)". Grigor Artsruni's gravestone, created like a cliff, is lost. Ghazaros Aghayan gravestone with the epigram: "Friend of children Ghazaros Aghayan" is lost too. Some epigrams are preserved thanks to A. Yeremyan, who rewrote and published in Vienna the epigraphs of Khojivank of 19th century end - 20th century start, and some single examples are preserved in the Historical-Ethnographic museum in Tbilisi. Yeremyan wrote, "there were thousands of granite, marble sculptures and stelea, thousands of short and exciting notes, sad poems and quatrains". ^ a b c d e Karapetyan, Samvel (1998). 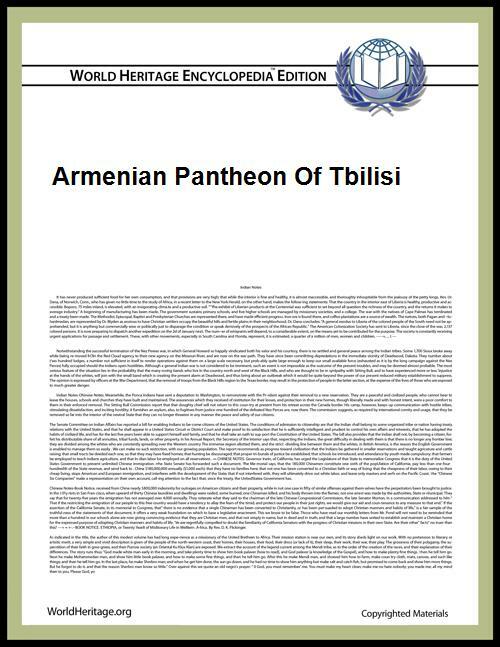 The State Policy of Georgia and the Monuments of Armenian Culture (in Հայերեն). Yerevan.